Number of Days Two separate days. 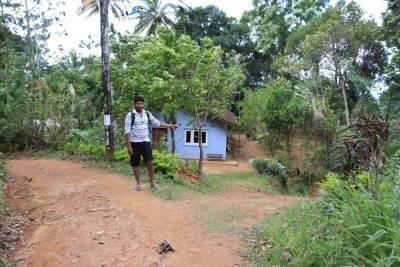 Road condition from Balangoda to Marathanna (Balangoda-Hatton road) is excellent. Some by roads are not in good condition. Better have your own vehicle. Motor bike/4 w is ideal. 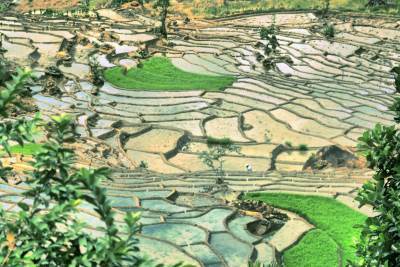 Soon after the rain is the ideal time to visit. Though I excepted much water, it wasn’t happened. Don’t bath at dangerous places. Before get in to the water ask from locals whether it is safe or not. 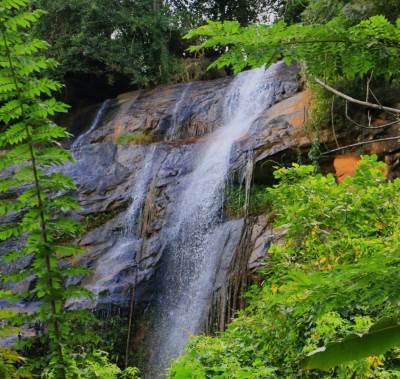 Get help from locals to get down along some waterfalls. They know safe places. 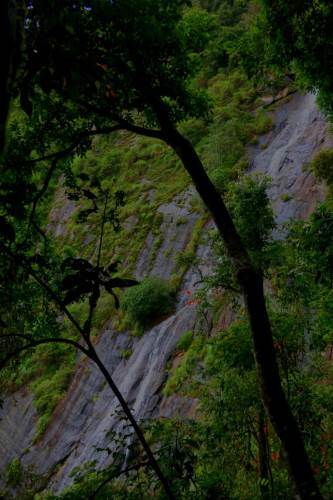 If you plan to reach base of Garandi Rikili Falls, first reach the nearest tea patch by the foot pathway I mentioned. It is essential to clarify your way to reach the base of Demali Falls. If it is a rainy season, expect leeches. There might be more waterfalls. This is what I could grab. Try to explore new ones in your visit. 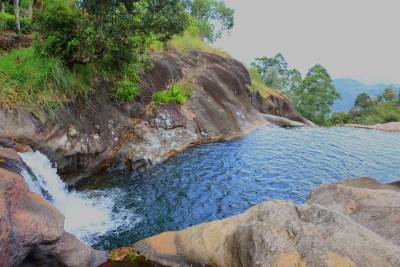 This was my back to back waterfall hunt in Rathnapura district. For my hard luck water levels were low in most waterfalls. Following waterfalls were visited. 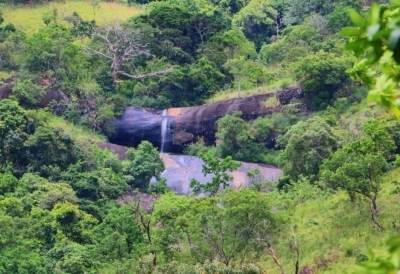 This 18m tall and 3m wide waterfall is situated at Pidaligannawela (පිඩළිගන්නාවල) village-Balangoda. When you travel along Balangoda-Hatton road, get the right hand turn (Nelliwala Road) at Keselkotuwa (කෙසෙල්කොටුව) junction. Travel along this road towards Pidaligannawela village and ask about the waterfall. 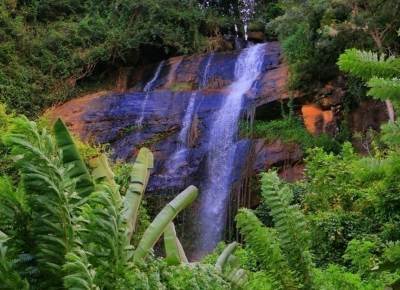 As it is a famous fall in this area everybody will direct you to the waterfall. But this is only the top of the fall where a bridge is situated. We passed the bridge and got first right hand turn and went down to reach the base of the fall through some vegetable crops. 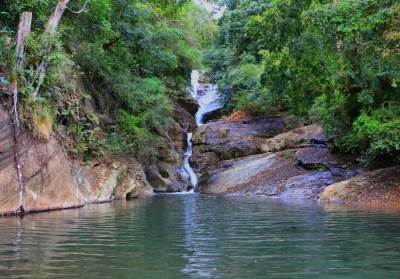 Balangoda Ranmudu Falls flows in few steps and this water will join to Samanala Wewa reservoir (සමනළ වැව ජලාශය) ultimately. There are different stories for the name-“Ranmudu” -රන්මුදු and everything based on a golden ring. 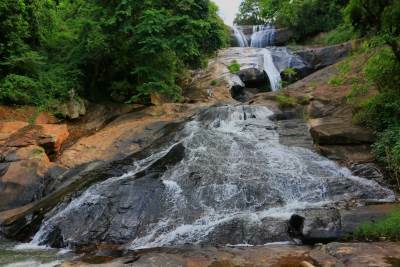 Earlier it was called Rathpini Ella (රත්පිනි ඇල්ල) or Thinioya Falls (තිනි ඔය ඇල්ල). Nirosh is showing the direction once we passed the bridge. Go to right hand side again through some vegetable plots to reach the base of the fall. 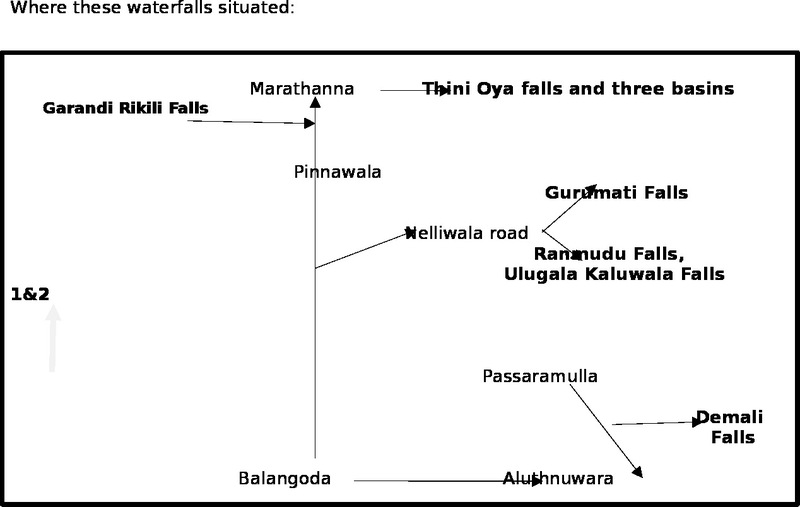 Balangoda Ranmudu Falls flows in different steps. 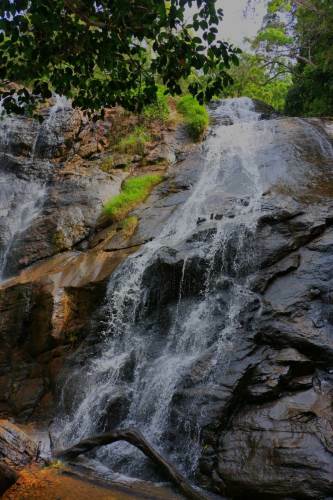 Middle part of Balangoda Ranmudu Falls. 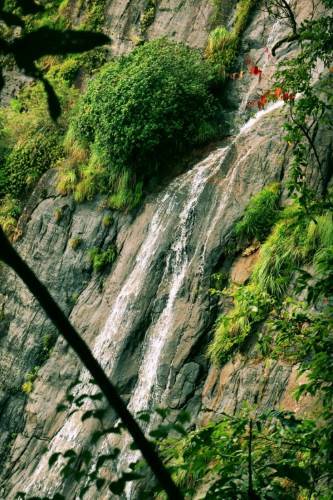 Upper part of Balangoda Ranmudu Falls. The bridge and road are situated above this. 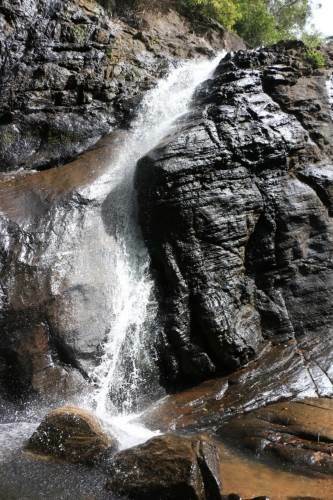 After Balangoda Ranmudu Falls, next waterfall was Ulugala Kaluwala Falls. 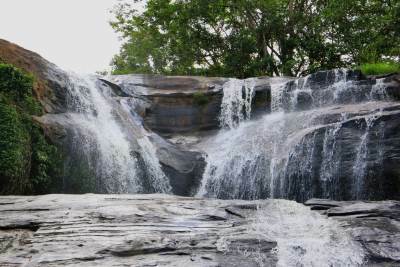 Ulugala Kaluwala Falls 1 and 2 (උළුගල කළුවල ඇල්ල). 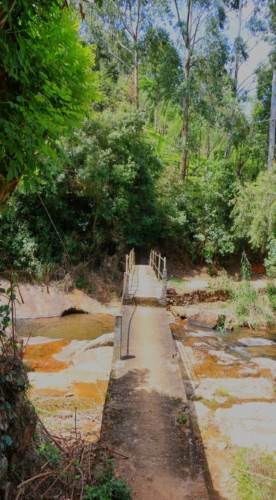 You have to pass the bridge over Ranmudu Falls and go along the road till it ends (About 1km). 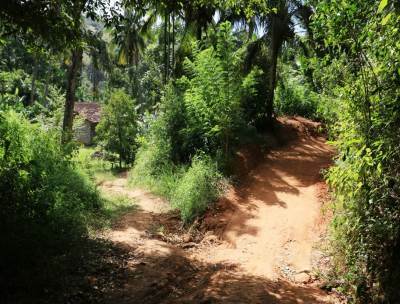 Once the gravel road ends, small pathway lies through paddy fields and then it again connects to a gravel road. 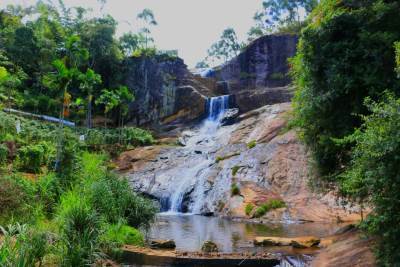 We went down along that road and it meets the water stream where you can view the waterfall with it’s shallow base pool. 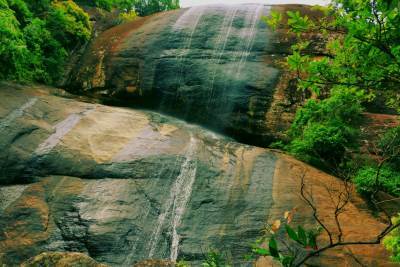 According to villagers this is named as Kaluwala falls. But we have noted another drop following this water stream and wanted to seek next step of the waterfall. Then we continued the foot pathway beyond the water stream and went down through the forest patch which was in our right hand side. 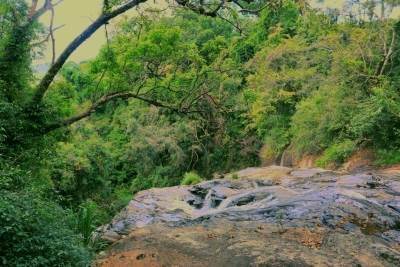 It brought us to the second step of Kaluwala Falls. 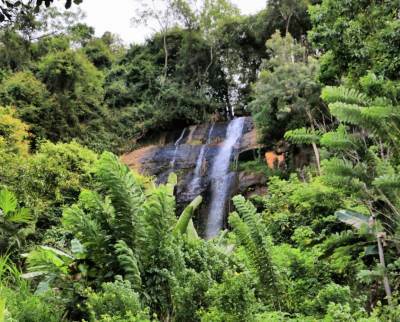 I would like to name the first waterfall as Ulugala Kaluwala Falls-1 and this as Ulugala Kaluwala Falls-2. Here road ends and get the left hand side foot pathway. Restarting of gravel road and turn to right. 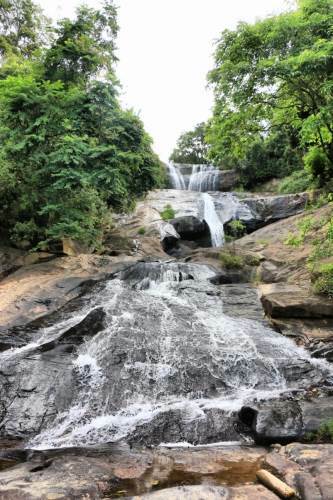 Thini Oya creates this 38m tall waterfall at Ulugala village. 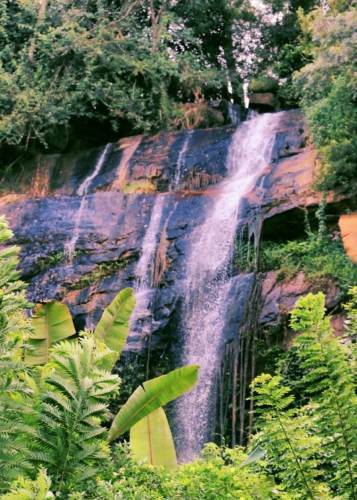 Due to the black pool at the base of the waterfall gives the name Kaluwala Falls. Ulugala Kaluwala Falls-1 with it’s black pool. Ulugala Kaluwala Falls-1 with it’s closer view. Acute drop following Ulugala Kaluwala falls-1 to make Ulugala Kaluwala Falls-2. 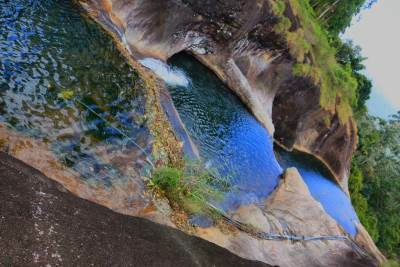 Thini Oya creates Ulugala Kaluwala Falls-2 soon after first fall. 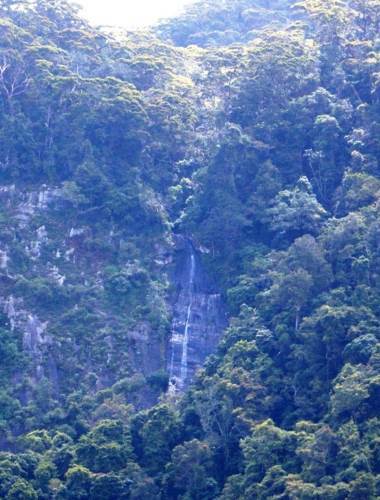 This waterfall has about 20-30m height. It flows as three parallel streams. Like first waterfall it doesn’t have a base pool. 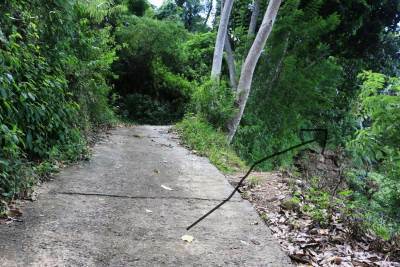 It’s accessibility is difficult and you have to go down through a forest patch to reach there. Ulugala Kaluwala Falls-2 with it’s parallel three streams. Ulugala Kaluwala Falls-2 with it’s parallel streams. 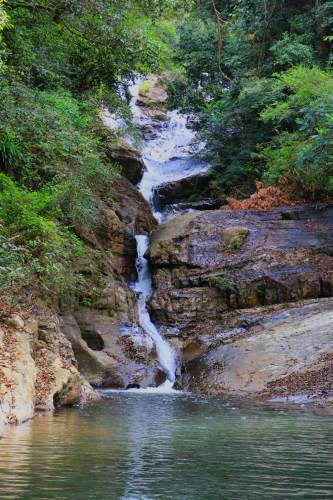 One of the parts of the water fall. 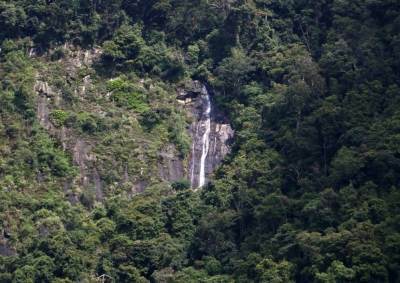 Our next target was Gurumati Falls (ගුරුමැටි ඇල්ල) which is not in the waterfall index. We drove back till we pass the bridge over Ranmudu Oya top and selected right hand side road (left hand side one is back to Keselkotuwa junction). At one place we could visualize the waterfall. 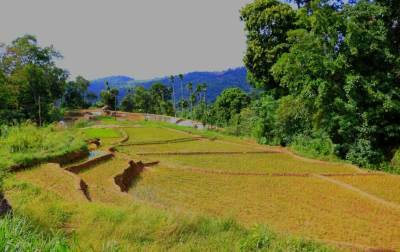 Once road becomes a foot pathway we stopped the bike and started to walk in the back ground of paddy fields. We got the directions from villagers to walk up along the concrete road. 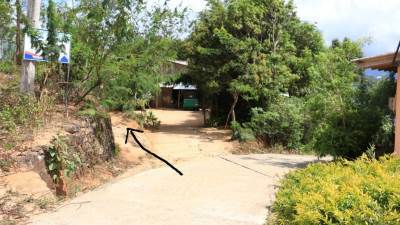 Then we had to walk along the foot pathway in right hand side of the concrete road till we find Gurumati Oya. Next part was to climb up parallel to Gurumati Oya through bushes to reach the base. 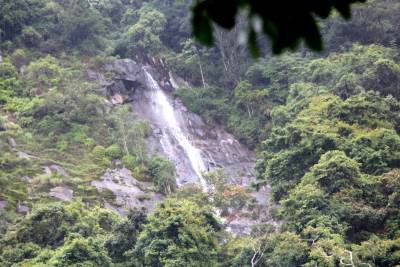 But it was unsuccessful and we had to satisfy from the distance view of the waterfall at the end. Get the direction showed by the arrow to reach the base of the waterfall. 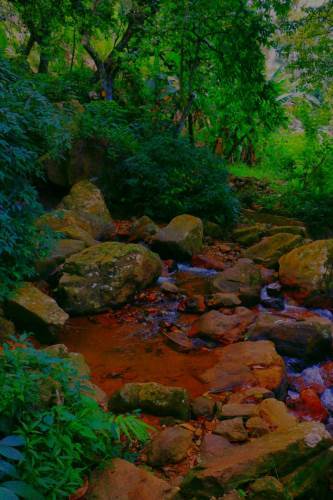 Water stream from the water fall-Gurumati Oya. 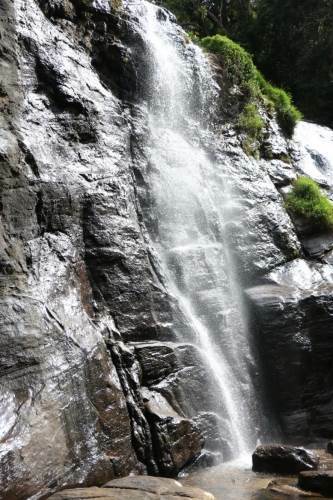 Gurumati Ella Falls has about 20m height and it is formed by Gurumati Oya (ගුරුමැටි ඔය). 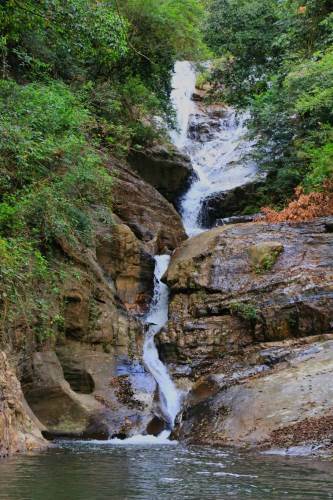 It is difficult to reach the base of the waterfall. 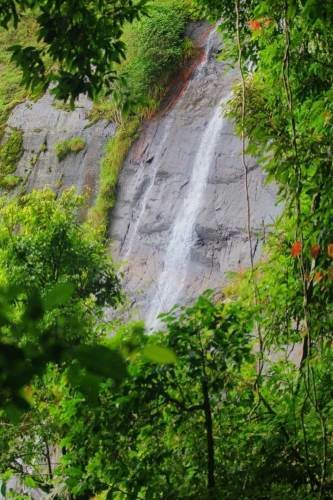 Gurumati Ella Falls through bushes. 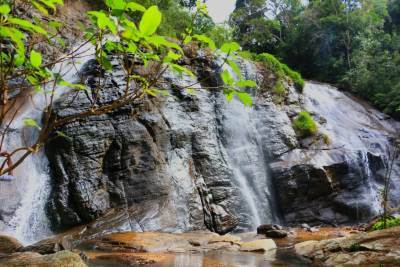 It was fine to cover three waterfalls in close proximity and we came back to Keselkotuwa junction. 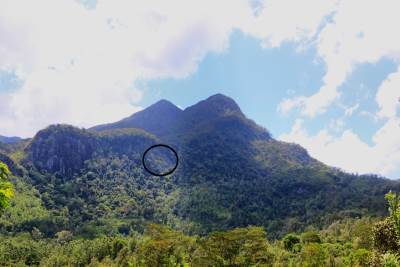 Then further drive along Bogawanthalawa (බගවන්තලාව) and our way up saw Garandi Rikili Ella (ගැරඩි රිකිළි ඇල්ල) at the base of Dethanagala Mountain. 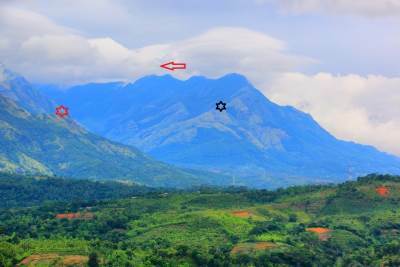 Dethanagala Mountain and Garandi Rikili Falls is circled. 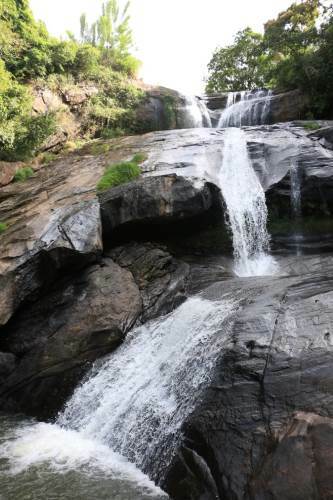 This 15m tall (Documented height) waterfall is formed by Bolthumbe Oya (බොල්තුඹේ ඔය) which starts from the southern slope of Dethanagala Mountain. 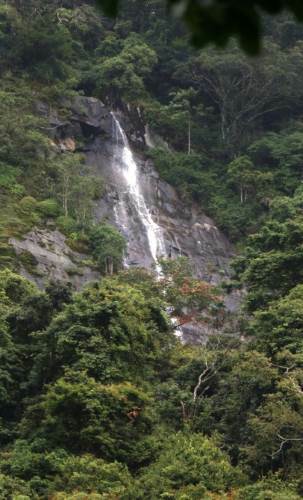 Waterfall can be seen from the main road soon after Budukatuwa junction. I wanted to explore this falls. Second day I got down (travelled by bus) at the junction just below Marathanna and walked down the road. 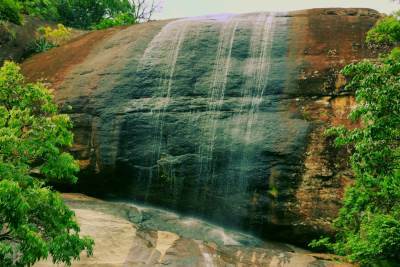 Then we located the waterfall at the slope of Dethanagala Mountain and walked towards that. 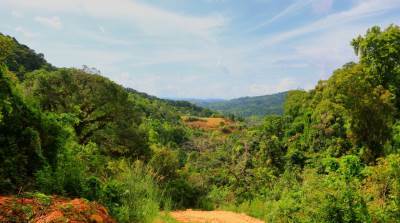 It was a 1-2 hours journey through tea bushes and end up at the forest patch which continues till Dethanagala forest range (Peak wildness sanctuary). 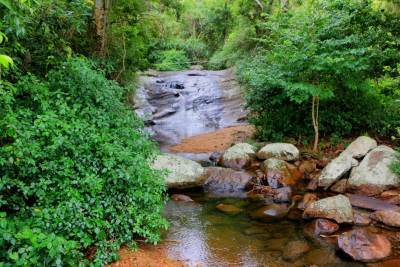 After a hectic hike through the forest we have reached the vicinity of the waterfall. But we were unable to reach the base of the waterfall due to acute steepness. Though it is documented as 15m tall, correct height might be about 100m. 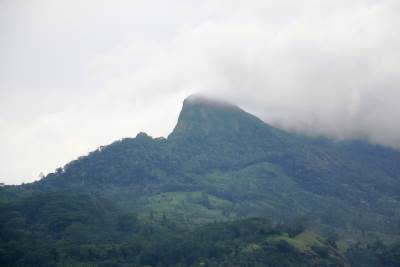 View towards Samanala Wewa reservoir, Hagala Mountain and Adarakanda. 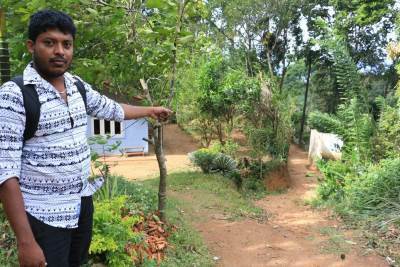 After failed attempt to Garandi Rikili falls we came back to tea estate and descend through the tea patch. 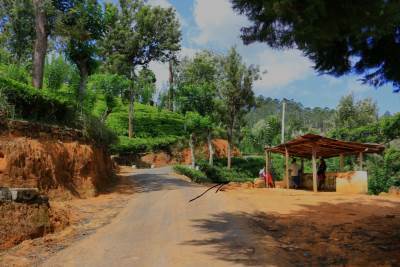 Later we realized it is easy to reach the last tea patch via that foot pathway rather than going through tea estate. 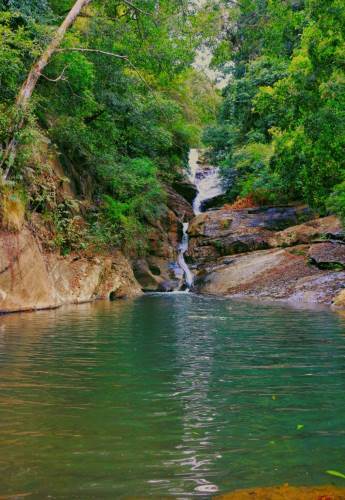 Some villagers told me they have reached the base of the waterfall by going upwards through water stream. This road will come across after 16/5 bokkuwa. 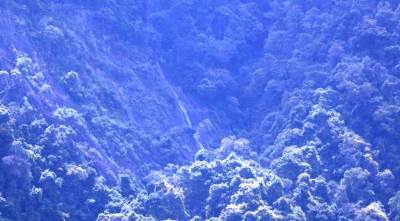 It becomes a foot pathway and reaches the closer tea patch to Garandi Rikili Falls. 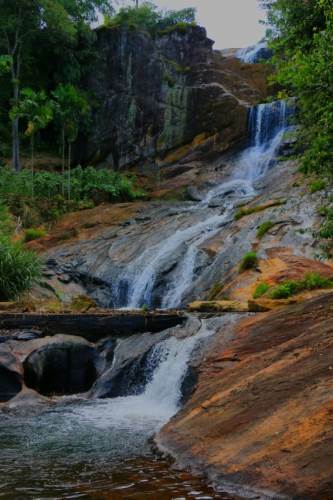 Then you can get down to the water stream of the waterfall and go up to reach the base. 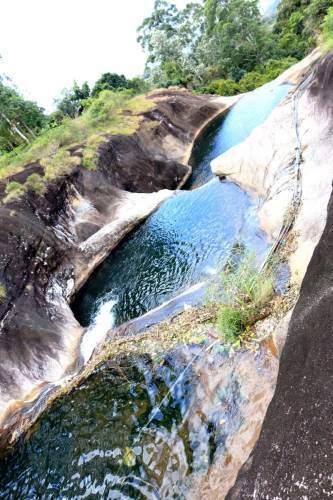 Thini Oya Falls and it’s three basins can be reached after 20th kilometer post in Balangoda-Bogawanthalawa road. 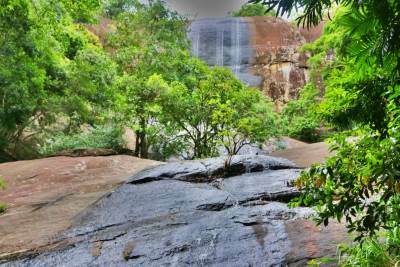 Thini Oya fall is 45m tall and it is formed by Thini Oya. 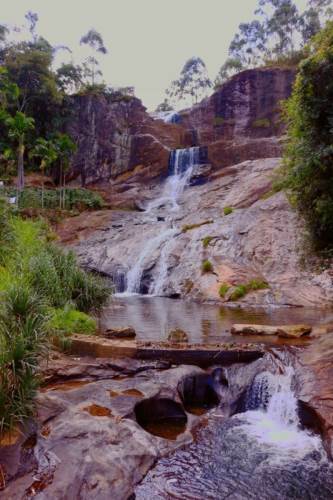 Before it flows as the waterfall, it forms three basins on top of the waterfall. As water is diverted for vegetable crops we were able to see fairly dry waterfall. After passing 20th Km post take right hand side foot pathway closer to bus stop. 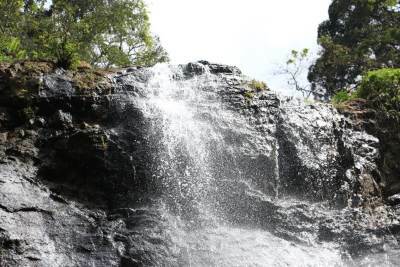 After visiting three basins we came down to reach the base of the waterfall in it’s left hand side. On our way back to Balangoda, we have noticed a board mentioning about a tall standing Buddha statue situated closer to Pinnawala town. Though it is mentioned about 0.25km from the road it was about 1km. 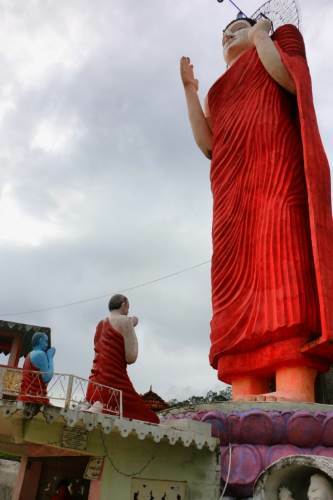 Apart from newly built Buddha statue it provides good panoramic view. 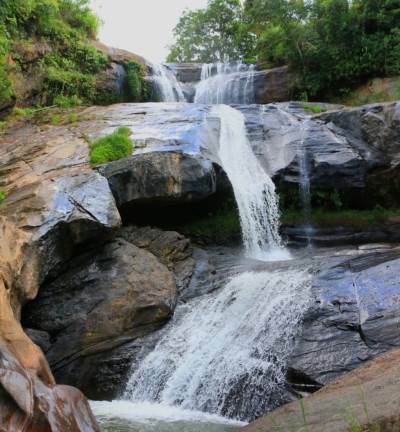 Demali Falls is situated closer to Balangoda-Passaramulla (පස්සරමුල්ල) road. 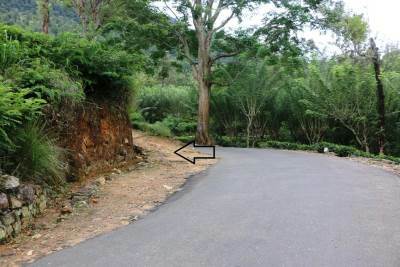 This road connects to Nelliwala (නෙල්ලිවල) road (where Gurumati, Ranmudu and Kaluwala falls situated) as well. 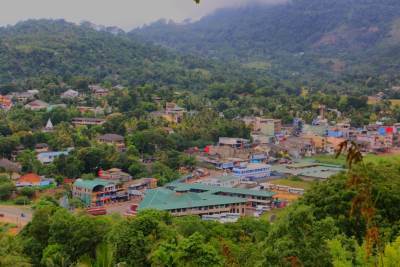 We came to Aluthnuwara (අලුත්නුවර) after passing Balangoda town and went along Passaramulla road. 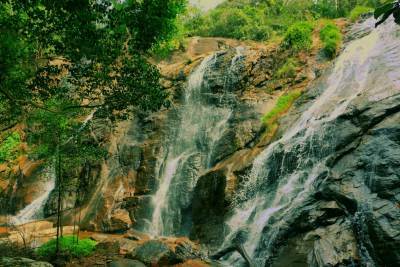 After about 2km walk along Passaramulla road, we were able to view Demali Falls in our right hand side. For my bad luck it was fairly dry waterfall in these days. 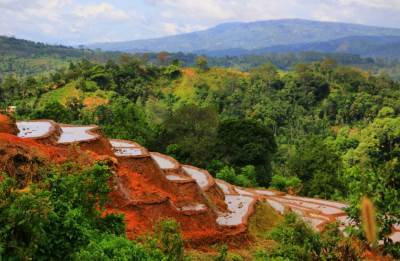 There was a foot pathway just before the first view point of Demali Falls. Next attempt was to reach the base of the waterfall. It is essential to clarify your way along this foot pathway as you have to cross number of things. After about 3km walk we reached a pepper estate which seems abounded. Then this foot pathway crosses the main water stream and luckily we met a villager. According to him we are at the top of the main fall now, but not able to reach the base of the main fall in this way. Again we went back and got into the water stream by crossing one of pepper estates and went up along the stream to reach the base of the falls. It was a shame for me to show this dry waterfall to my friend. 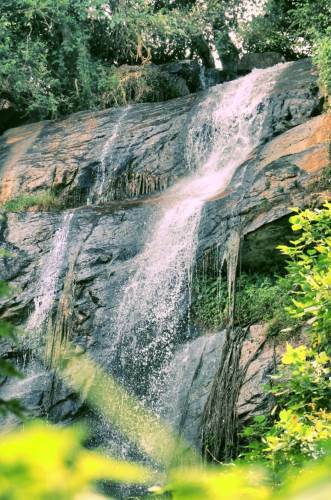 This 105m tall waterfall is considered as the 12th highest waterfall in Sri Lanka. 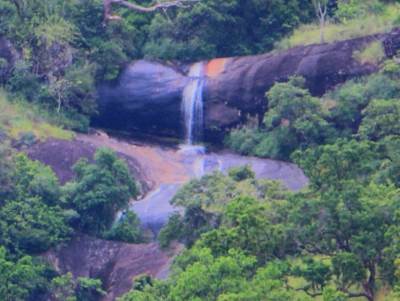 Water stream origins from Hagala (හාගල) Mountain and flows as Demali Falls and joins to Deni Oya. There are number of folks to explain the name of the waterfall. Some of them go back to King Rawana era and some related to King Walagamba (වළගම්බා). 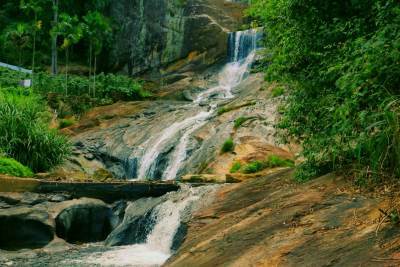 As it flows in two steps it was called as “Demala”-දෙමාල falls. Later became Demali Falls. Distance view of Demali Falls at the bend. Crossing of the water stream at top of the waterfall. 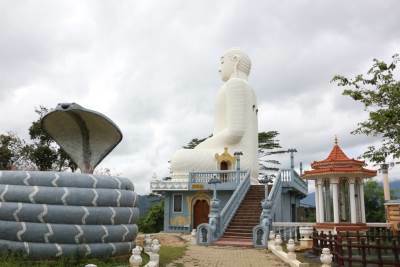 When you are passing Balangoda town, you may notice a Buddha statue situated on the rock at the center of the town. We wanted to visit there at the end of the journey. This temple is called Shailathalaramaya. There are two ways to reach there. 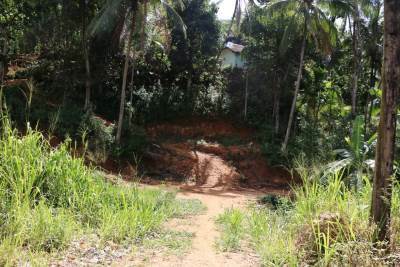 The mortable road begins from Balangoda-Badulla road. We followed the foot pathway behind the bus stand. 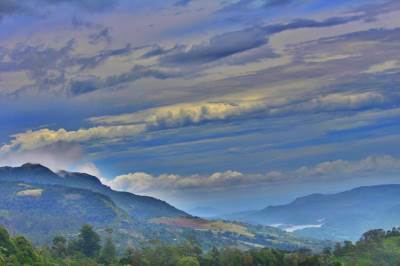 On top of Shailathalaramaya you can view Pettigala, Dethanagala and peaks of Belihuloya side. 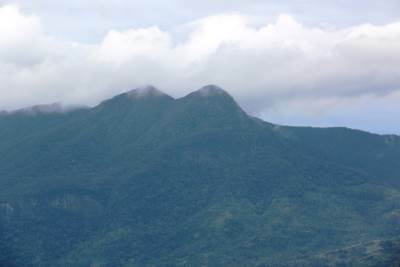 Mountains at Belihuloya: Red star-Hagala kanda, Black star-Adarakanda, red arrow-Balathuduwa and Gommolliya.